Corner rolling is possible only when SprutCAM creates an offset toolpath. Selection of the roll type can be made on the <Strategy> page. 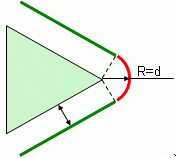 Select the Corner roll type area by choosing either the By arc or By tangent mode. When rolling by arc, an arc whose radius is equal to the offset value will be inserted into the toolpath corner. In <By tangent> mode the cuts are used to roll the corner. The tool path before and after the corner is extended on the offset length. If the extended path is intersected then it is truncated in the intersection point. Else the connection cut is added.